The European Association for Life Science (EALS) was founded in 2015 with the aim to develop Life Science in Europe. 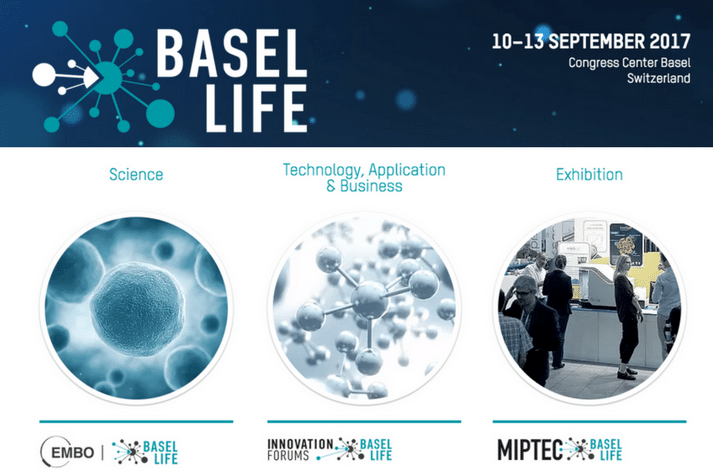 The nonprofit Organization positions the congress “Basel Life” to act as a bridge between basic research and translational research, as well as science and business. “Basel Life” will take place from the 10th until the 13th September 2017 in Basle. The concept of Basel Life 2017 is based on three pillars: science, technology and exhibition. Each of those is represented in an event of global appeal. The EMBO, European Molecular Biology Organization, is responsible for the organization of a high quality international scientific congress. In the “Innovation Forums”, leading scientists present their innovating methods and technologies and provide information about the current state. For the past 20 years, the Mip Tec exhibition has been operating successfully in the Life Science market and has brought together over 100 international exhibitors, who present their latest technologies and solutions in research and development. As a special highlight Sir Paul Nurse, Director and Chief Executive of the Francis Crick Institute, London, will give the opening speech. This event will take place on Sunday, 10th September 2017 from 17.00 until 18.00 in the “Kunstmuseum” in Basel and is open to the public (pre-registration required, register here: www.basellife.org). Throughout the four days of the Congress “Basel Life” will be offering a knowledge transfer at the highest international level. Among the main speakers will be Jennifer Doudna, UC Berkeley, USA, and Svante Pääbo, MPI for Evolutionary Anthropology, DE, as well as many other excellent speakers. Andrea Schenker-Wicki, the rector of the University of Basle, chairs the governance board. Alongside her, as Vice-President is Susan M. Gasser, Director of the Friedrich Miescher Instituts (FMI) in Basel as well as Matthias Leuenberger, Novartis, Dieter Scholer, member of the University Council, Christoph Eymann, Member of the National Council and Jürg Erismann, Roche. The Managing Board includes Roland Bucher, Bucher Biotec, as General Secretary, Thomas Hafen, BÜHLMANN Laboratories, as Treasurer und Gregor Dernick, Roche, as Actuary. Matthias Geering, the University of Basle as well as Michael N. Hall, Professor at the Biozentrum, act as extraordinary members.